Located in the lush foothills of North Boise, Idaho, the Boise Hillside Suites offers a comfortable alternative to a regular hotel or guesthouse. 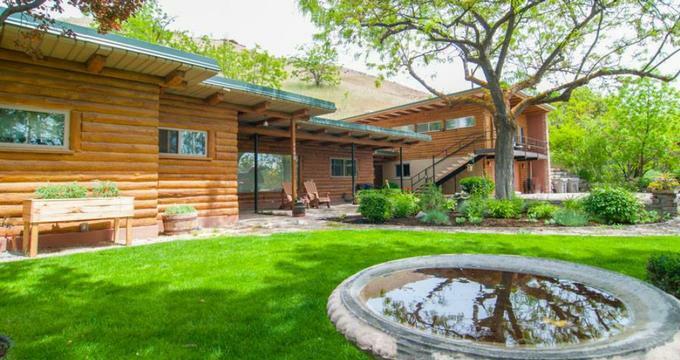 Surrounded by beautifully manicured gardens and grounds in a quiet and secluded area of Boise, the tranquil retreat is set in a timber Frank Lloyd Wright-inspired building with a striking architectural design and sleek, clean lines. The hotel features luxury suites with contemporary décor and furnishings, en-suite bathrooms, sitting areas with plush sofas and working fireplaces, modern conveniences and porches with outdoor seating and stunning views. The Boise Hillside Suites are ideally located for exploring the town of Boise, which is the capital city of Idaho and packed with interesting things to see and do. A series of tree-dotted trails and parks known as the Boise River Greenbelt is perfect for walking, jogging, running and relaxing against a backdrop of lovely river views, while in town there are several museums, art galleries, shops and restaurants to discover. The Boise Art Museum is set in a beautiful Art Deco building and houses an exhibition of contemporary works and an exquisite outdoor sculpture garden, and the Idaho State Capitol Building, which is set in an elegant sandstone building is well worth visiting. The Old Idaho Penitentiary is an excellent example of a 19th-century prison complete with cells and gallows, and historic military weaponry. Boise Hillside Suites offers three beautifully appointed and stylishly decorated luxury suites with contemporary décor and modern furnishings. Each suite has a private entrance and porch with outdoor seating and gorgeous views, and offer comfortable king or queen-size pillow-top beds with high-quality linens and pillows. En-suite bathrooms have bath-and-shower combinations, fresh towels, and branded toiletries, and spacious sitting areas provide sofas, armchairs, and working fireplaces. Modern amenities in every suite include flat-screen televisions with cable channels and free Netflix, mini-fridges, Keurig coffeemakers, microwaves, and complimentary wireless Internet. Marjorie’s Library is the most significant suite at the hotel and features a private driveway and entrance, a spacious living room with plush sofas and armchairs and a large fireplace. The suite has a queen-size pillow-top bed with high-quality linens and pillows and an en-suite bathroom with bath-and-shower combination, fresh towels, and branded toiletries. This suite also has a romantic hot tub for two and a private terrace with a patio table and umbrella for relaxing. Modern amenities include a flat-screen television with cable channels and free Netflix, mini-fridge, Keurig coffeemaker, microwave, and complimentary wireless Internet. John’s Study is a deluxe suite with a queen-size pillow-top bed with high-quality linens and pillows and an en-suite bathroom with bath-and-shower combination, fresh towels and branded toiletries. A separate living room has plush sofas and armchairs and a faux fireplace, and a private terrace boasts beautiful views of downtown Boise and the Owyhee Mountains. Modern amenities include a flat-screen television with cable channels and free Netflix, mini-fridge, Keurig coffeemaker, microwave, and complimentary wireless Internet. Located on the first floor, Joan’s Sweet is a compact, studio-size apartment with a private entrance that is ideal for the single traveler. The neat studio suite features a queen-size pillow-top bed with high-quality linens and pillows and an en-suite bathroom with an original 1950’s concrete corner shower, fresh towels and branded toiletries. The suite offers a wet bar with a sink and refrigerator, as well as a flat-screen television with cable channels and free Netflix, and complimentary wireless Internet. Boise Hillside Suites does not serve breakfast, but there are mini-fridges, Keurig coffeemakers, and microwaves in each suite for self-catering and downtown Boise is a short walk away where guests can find many restaurants, cafés and coffee shops. Boise Hillside Suites is surrounded by beautifully manicured gardens and grounds in which guests can relax and is a short walk from downtown Boise, which offers a variety of attractions and activities to enjoy, ranging from visiting museums and art galleries to walking along the Boise River Greenbelt, shopping and dining out.